The results on this project speak for themselves! 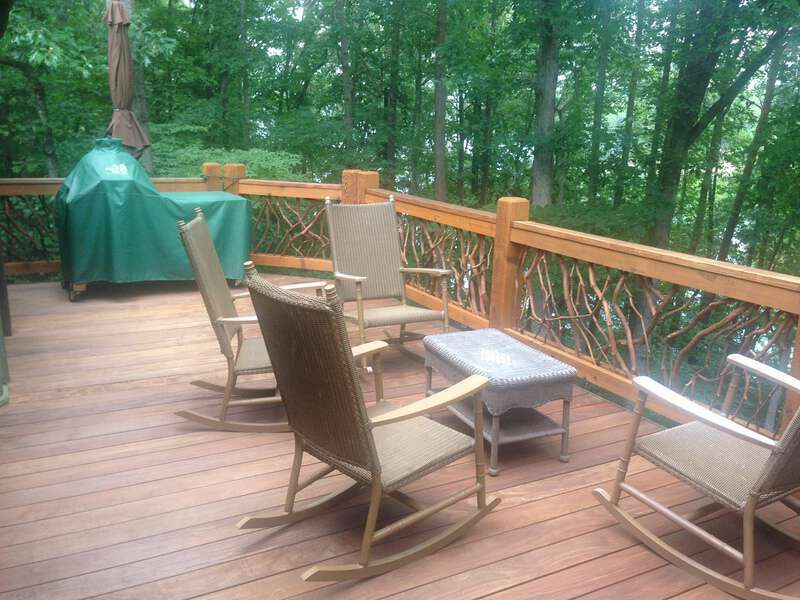 The homeowner went with an ipe decking but wanted a contrast for the railing lumber which is rough sawn red cedar 2x4s. The railings are finished on site with rough sawn cedar 1x4s and the top plate is a 1×6 ipe decking board. 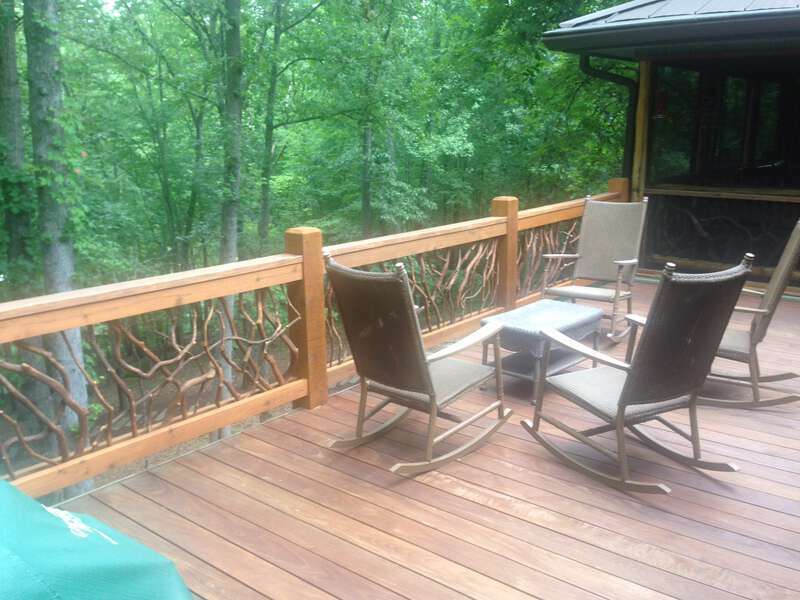 The sticks on this railing are stained with Cabots Exterior Deck Stain in the Natural color. 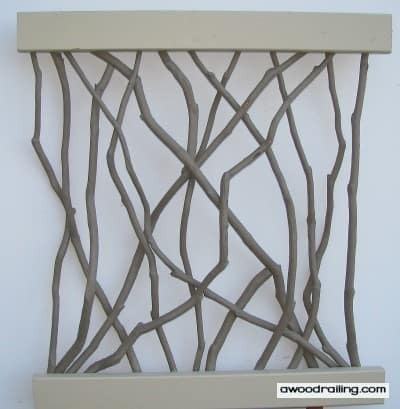 This helps preserve and enhance the natural red color of the mountain laurel sticks. It also darkens them and adds some shine. 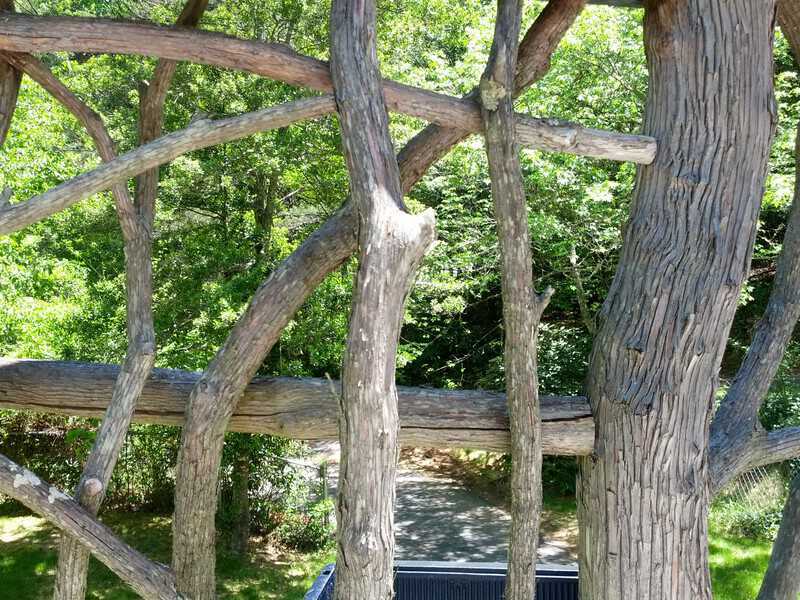 A common question about Mountain Laurel Handrails is, “What does the mountain laurel look like when it weathers?” Well, it looks a lot like a piece of cedar that turns silver with exposure to the sun. But, since pictures are worth a thousand words, here are some pictures of mountain laurel that has weathered to a silver color. This picture is of weathered and silver mountain laurel with full sun shining. The next picture is with partial sun and shade. 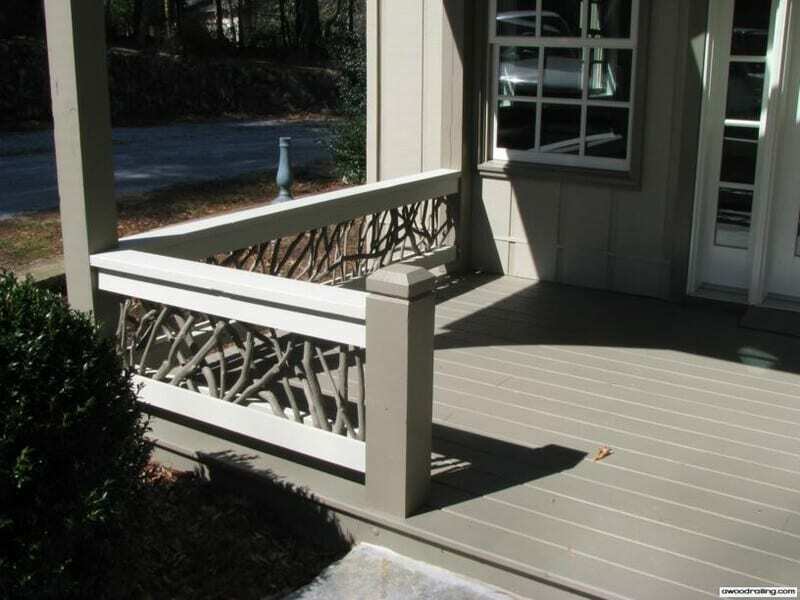 Some of you might remember a recent wood deck railings project I posted that was installed at the Summer House in Highlands, NC. I passed by there recently and noticed that the painters had been through and work was about complete on their new Idea House Showroom. 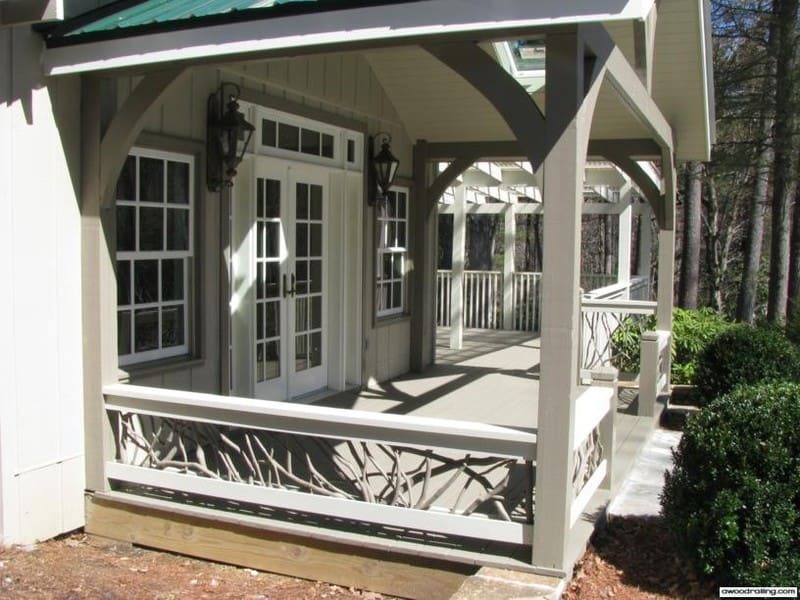 The sticks and branches on these custom railings have been painted to match the color scheme. I love this picture with the timber frame porch railings in front with the green of the forest beyond. The left picture shows a wood railing section before it was delivered. Each section was carefully painted before being delivered. It’s quite time consuming and requires a delicate hand to avoid errors. But painting the sticks is a great way to get the look that perfectly matches your colored schemes. 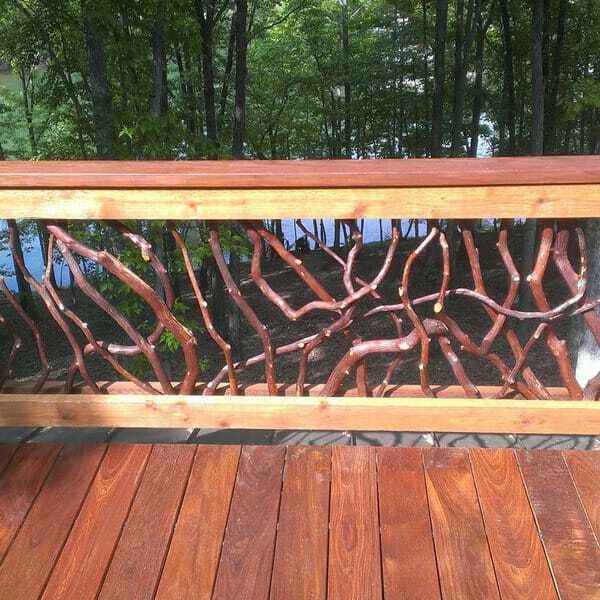 Sticks can also be stained and this is another good way to add another level of customization to your Mountain Laurel Handrail project. I seriously just noticed that these railings were repainted after we installed them. In the picture directly above you can see that the cedar 2x4s have been painted a light gray but in the pictures after all work on the project had been complete, the lumber is a much brighter white to match the windows and doors. I think this looks much nicer than the original color which would have matched the color of the posts. 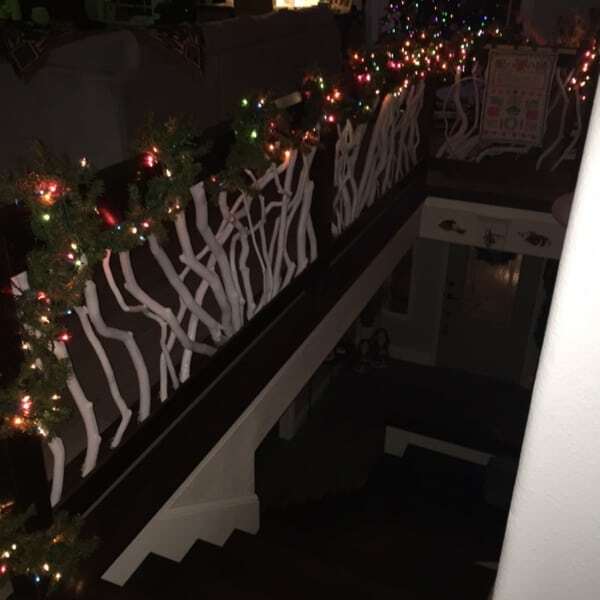 The white lumber gives the sticks plenty of contrast to set them off! The designer on this project has a strong eye for detail and color. She brought together many local crafters to work on this project. She also keeps many of these items available in her store and is ready to help with design and decor suggestions and ideas. On the right is another picture when there was snow on the ground. White snow and the evergreen forest make a great backdrop. 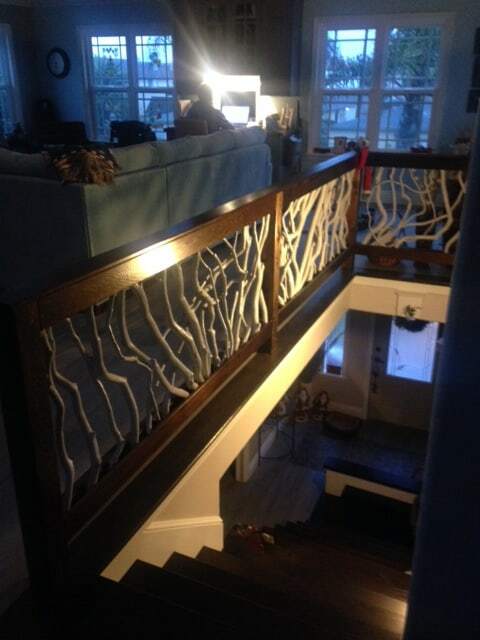 New pictures have just arrived of a stairwell railing. 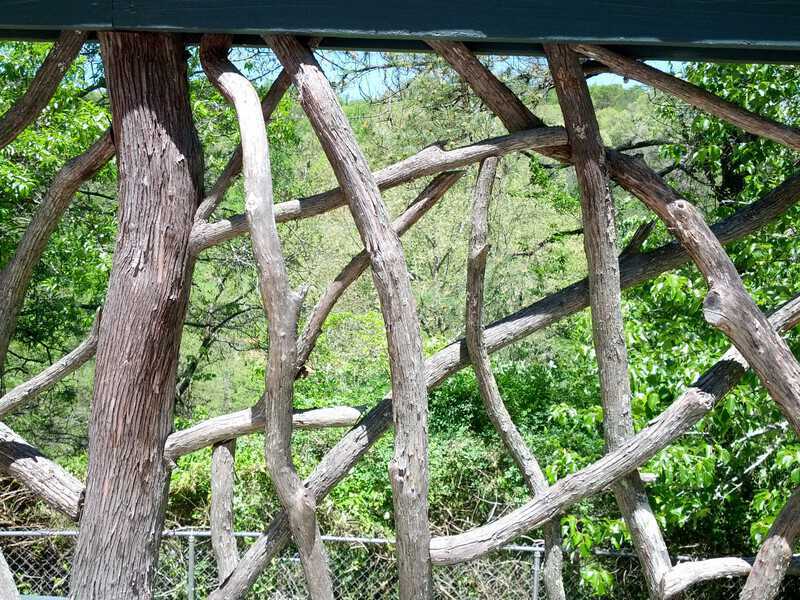 For this project, the lumber is stained dark walnut and the branches have been painted off-white for an absolutely stunning effect. I really like how this turned out. What do you think? 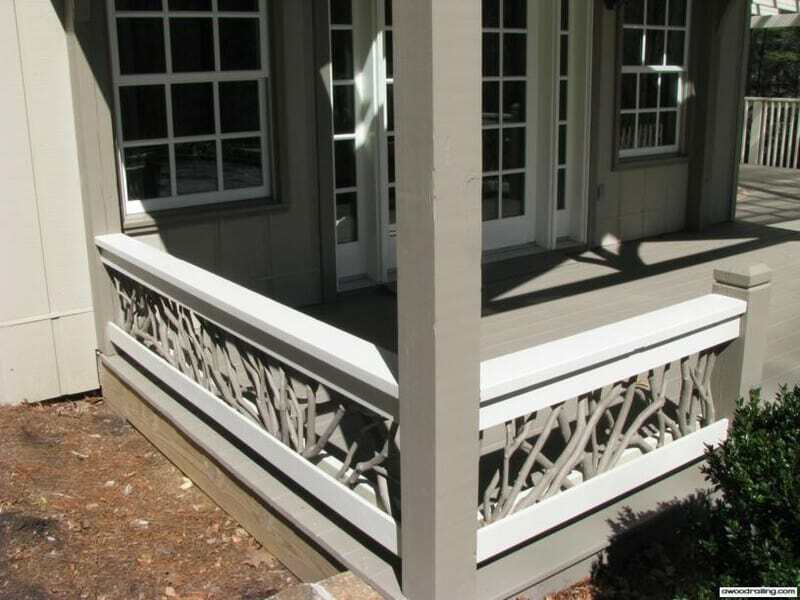 Straight and simple rails stained in mocha make a stunning contrast to the silvery white branches that form balusters. Together, these elements create an abstract piece of art. 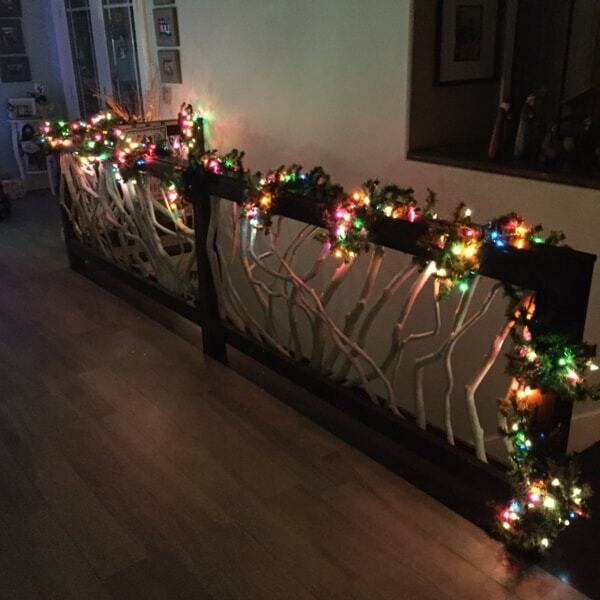 Then, to bring on the holiday cheer, the homeowner decorates the balcony railing with bright, colorful lights wrapped in garland. 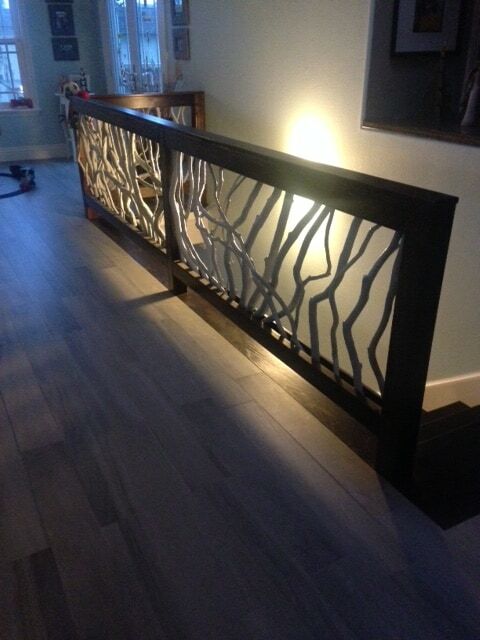 Just sent some pictures of my beautiful railing. Everyone has to comment when they see it. Truly unique and perfect for our beach home. Earthy and perfect !